September 29, 2013 — I don’t know how you feel reading this, but I’m feeling exhausted as I write it. The good kind of exhausted. The accomplished kind of exhausted. The if-I-died-today-it-would-still-take-me-a-long-time-to-recover kind of exhausted. Yesterday we did a 12-hour, 420-mile road trip through Vermont (although some of those hours were spent in New Hampshire getting to Vermont). Actually, it was longer than that mileage-wise because we took the proverbial wrong turn at Albuquerque at one point and ended up way out of our way at a dead end on a rutted dirt track in the middle of a forest graveyard. We have a car GPS, two smartphones, and only front-wheel drive, so I’m not sure how that happened. Most of this particular road trip experience for me was buoyed by the Oxycontin I’m currently on to deal with the fallout from an emergency root canal I had on Friday, but I still think a lot of my high came from driving through a fully formed, peak-foliage Autumn that seemed more like an actual place than an ephemeral season. The roads just go by faster when the trees are red and orange. 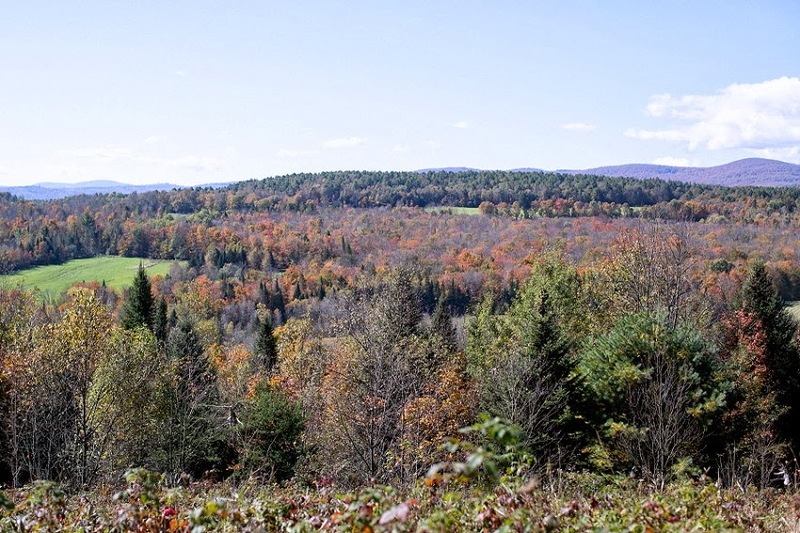 It was our first major road trip of the season, and it just felt good to be on the road, passing across the porcupine’s back of white church steeples that tickle New England skies, the hand-painted plywood signs in every town announcing this fall festival or that haunted-house-for-charity. Seeing all the farm stands overflowing orange and red with pumpkins and apples, and the scarecrows staked into lawns despite whether their services were needed or not. 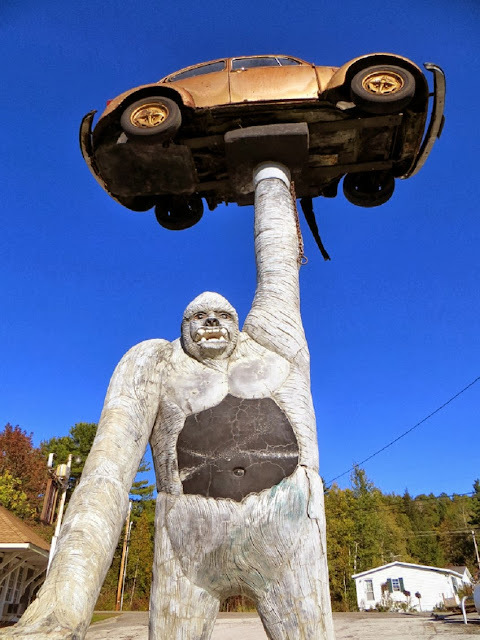 My plan for writing about this road trip was just to give you a brief overview of it, but it turns out that I’m going to have to delve more deeply into some of the sites in later posts. It’s just that many of them were Antarctic continents cooler than I expected them to be and deserve more attention. Heck, underestimating things was probably the theme of the whole road trip. Which means I’m really bad at pre-research. Or that Oxycontin makes everything better. Our first stop was two and a half hours north in the Phineas and Ferb town of Danville, Vermont. 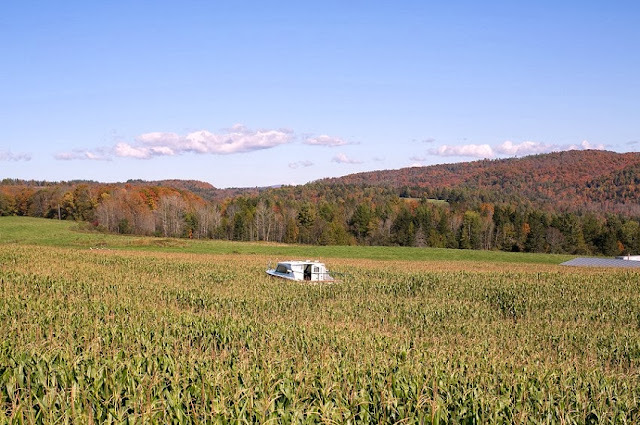 There, we wandered through the rows of the Great Vermont Corn Maze. It was our marquee stop, the one place that as long as we made it there meant that the entire trip was a success, even if we couldn’t find anything else on the itinerary or if the car broke down or if we got waylaid by mutant cannibals in a radioactive wasteland. At least we did the corn maze. 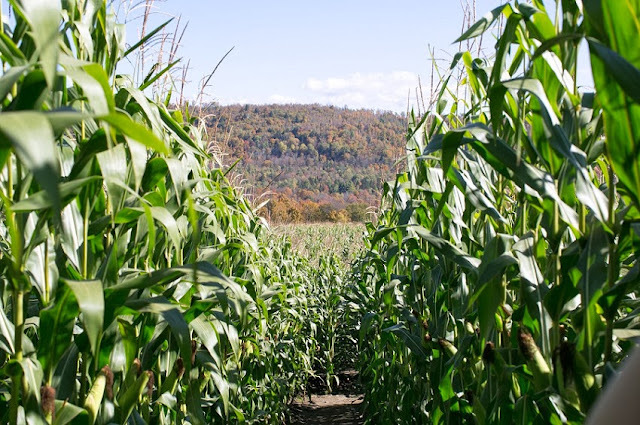 I’ve written about corn mazes in the past, so I wasn’t planning to write about this one, but I have to do a whole post on it. What was supposed to be a simple autumn tradition turned into the best maze I’ve ever done. And by done, I mean had to take the emergency exit because it didn’t seem like we’d ever complete the maze. Yes, this maze had emergency exits. It had to. Like I said, story for another day. 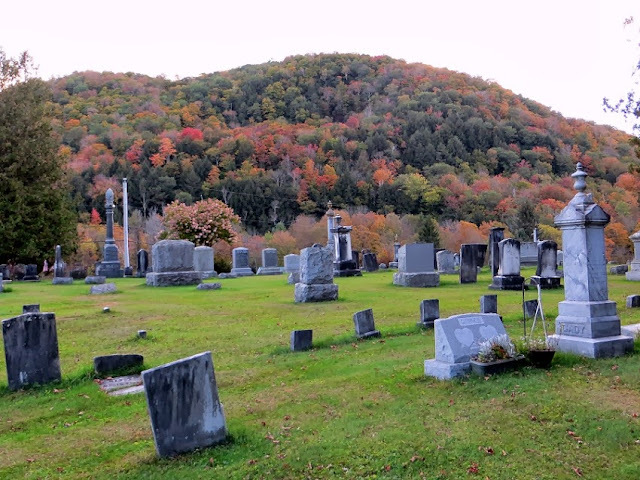 En route to our next stop, we inadvertently passed the famous Hope Cemetery in Barre, site of numerous unique gravestone sculptures. 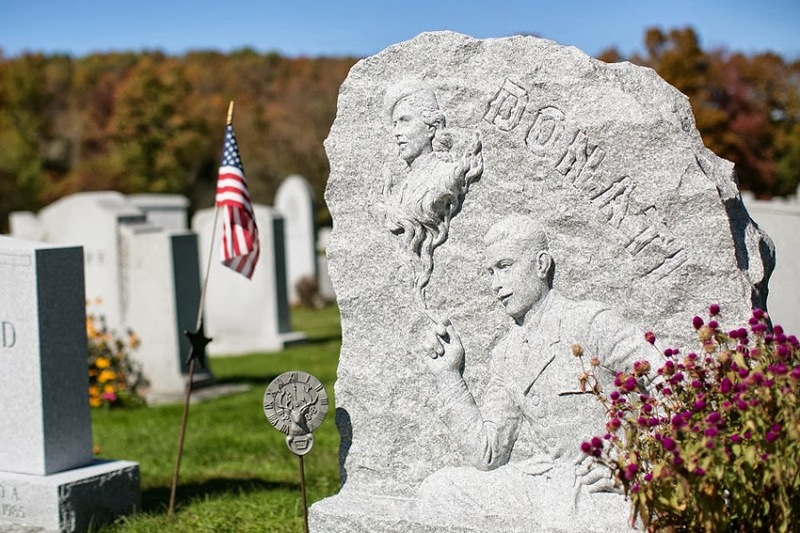 I wrote about this one in The New England Grimpendium, and it’s a cemetery I’ve never really dug too much, which is why it wasn’t on my official agenda. But, since we were passing right by it, we took a quick spin through. Now, four years after my initial visit and experiencing it with a backdrop of autumn doesn’t change my opinion. It’s still kind of a cheesy, cartoony cemetery, even if it is uniquely so. Go see it, of course, if you get the chance. Just mitigate your expectations somewhat. Speaking of expectations, I had no idea what was going on with our next stop...I wasn’t sure if it was open, still around, if it was just a claptrap shed behind somebody’s house. Still, it was called Spider Web Farm, and just for its name was worth some awkwardness to find out. 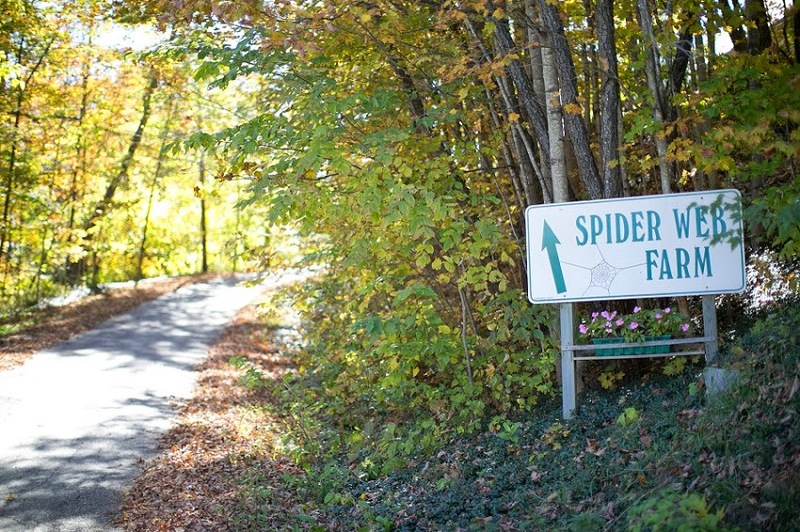 Spider Web Farm is a small art project/gift shop in Williamstown run by a man named William Knight for the past 40 years. 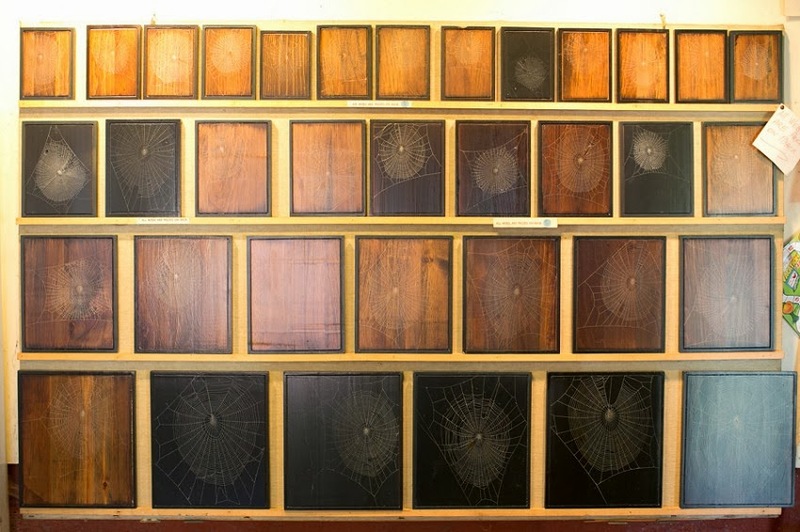 He culls spider webs by affixing them to boards with glue and then sells them as art pieces. It’s a pretty awesome project and, upon arriving and getting to talk to both Knight and his wife, turned into a pretty awesome experience. Can’t wait to tell you about this one. From Knight’s Spider Web Farm, we traveled to Leicester to see a statue. 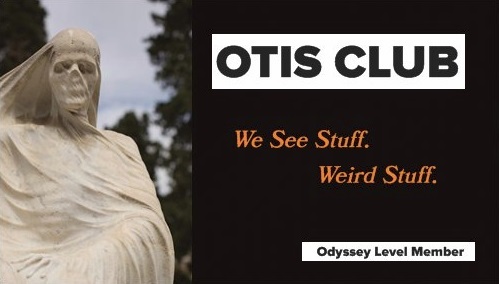 This guy’ll appear on some OTIS Miscellany post in the future not because he isn’t cool enough to merit his own post, but because his coolness is of the type that doesn’t need elaboration. You just accept it. Watch: A 25-year-old, 19-foot-tall white ape holds aloft a real Volkswagen Beetle with one manacled arm. See? Our last stop before heading home to New Hampshire was Laurel Glen Cemetery in Shrewsbury. We were there to see one grave, but, man, what a grave. And what an oddity in general. 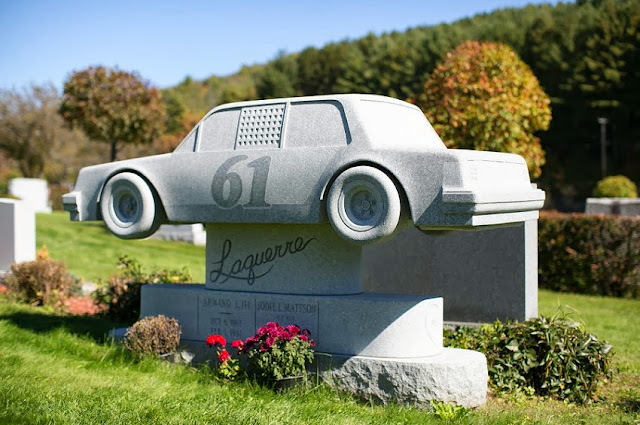 I honestly thought, based on the images online, that the sculpture would be disappointingly Hope Cemetery-esque, and threw it on the itinerary just to break up the home stretch of our drive. 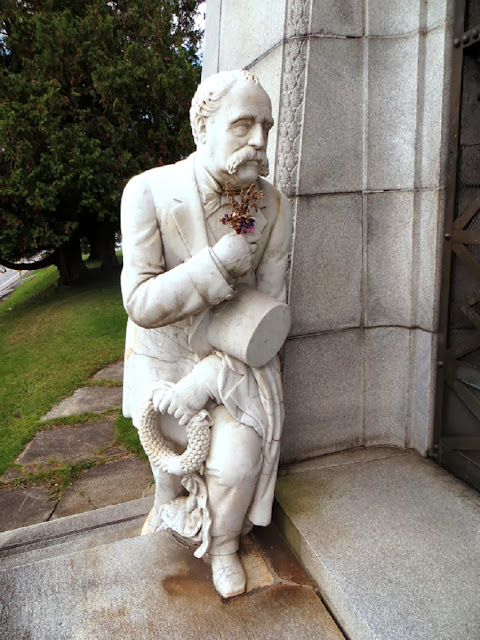 I mean, even reading up on the John P. Bowman Mausoleum, you basically just learn that a rich guy has a sculpture of himself forever grieving at the door of his own mausoleum. And that’s true, but it’s not just the sculpture that’s interesting, but everything about the mausoleum, from the stuff inside it to the stuff across the street from it to its placement in the graveyard. It’s another oddity I look forward to telling you more about. But, like I said, I’m exhausted. Exhausted enough that I went to bed last night two hours earlier than I usually do after staying up just long enough to throw down what you’re now reading. This morning I’m still groggy as I touch up the post for public consumption. Which mostly just means removing about 20 Oxycontin references.